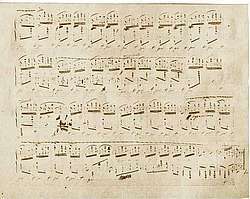 “Elsner praised the Concerto’s Adagio saying that it is a novelty, but I do not want anyone’s verdict on the Rondo since I am still not quite pleased with it.” - From the letters of F. Chopin to Tytus Woyciechowski in Poturzyn, Warsaw 3 and 20 October 1829. “[…] I am surprised that the Adagio made such a universal impression; whether I turn, I hear only about the Adagio.” - From the letters of F. Chopin to Tytus Woyciechowski in Poturzyn, Warsaw 27 March 1830. “You have not written yet whether […] you shall have the first [Concerto] printed; I believe that this one will certainly be well liked.” - From a letter by Mikolaj Chopin to F. Chopin in Paris, 11 April 1835. (1) Breitkopf & Haertel published an arrangement for pianoforte solo shortly after the 1st publication. (2) First known performance was privately in Chopin's home on 1830/3/3, with Kurpinski conducting. Public performance a fortnnight later in National Theatre, Warszawa. 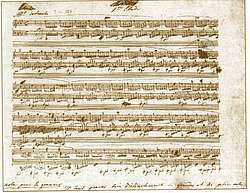 (3) The work was called 'Second Concerto' on publication due to a delay in preparing the orchestral parts. In order of composition it is the first, though. The Andante Spianato for pianoforte in G Major (Br. 88) was composed in 1834.